Mother Bee Moisturising Lotion Bar with Beeswax, Natural Oils, Ylang Ylang & Lemongrass in a 95 Gram Bar. 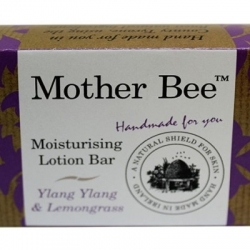 The Mother Bee Lotion Bar is a revolutionary concept in hand and body care. Shaped like soap the Mother Bee lotion bar is applied to tired, dry and compromised skin without water. It is quick to apply and locks in moisture. Mother Bee’s exclusive mix of Beeswax, Natural Oils, Ylang Ylang & Lemongrass creates this handy little bar, that is great value for money, easy to apply with no waste. Renowned as a base for applying fake tan or as an everyday rejuvenator of weary skin, it is a must for your skin care routine. It is not soap as you apply the lotion bar without water on dry skin and do not rinse off. Prunus Dulcis (Almond) Oil, Cera Alba (Bees Wax), Theobroma Cacao (Cocoa) Seed Butter, Cocos Nucifora (Coconut) Oil, Butyrospermum Parkii (Shea Butter) Fruit, Tocopherol (Vitamin E), Canaga Odorata (Ylang Ylang) Flower Oil, Cybopogon Schoenathus (Lemongrass) Oil. A perfect gift to obtain fabulous lovely skin.